Relief from both cold and flu symptoms, including sinus pain, congestion and head colds. This medicine is used for the relief of symptoms of colds and ­­flu, including aches and pains, headache, blocked nose, sore throat, chills and chesty coughs. 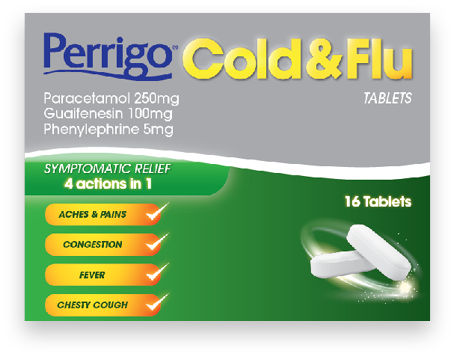 Perrigo Cold & Flu Tablets, Paracetamol 250 mg, Guaifenesin 100 mg, Phenylephrine 5 mg. For the relief of symptoms of colds, flu and chesty cough. Do not take with any other paracetamol-containing products or with other cold or decongestant products or cough suppressants. Always read the leaflet. This medicine is used for the relief of the symptoms of colds and flu and the pain and congestion of sinusitis, including aches and pains, headache, blocked nose and sore throat, chills and feverishness (high temperature). It can also loosen stubborn mucus (phlegm) and provide relief from chesty coughs. 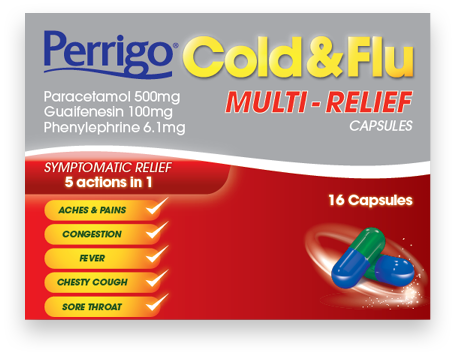 Perrigo Cold & Flu Multi-Relief Capsules, Paracetamol 500 mg, Guaifenesin 100 mg, Phenylephrine 6.1 mg. For the relief of symptoms of colds, flu, sinusitis and chesty coughs. Do not take with any other paracetamol-containing products or with any other flu, cold, decongestant products or cough suppressants. Always read the leaflet. This medicine is used for the relief of the symptoms of colds and ­flu and the pain and congestion of sinusitis, including aches and pains, headache, blocked nose and sore throat, chills and feverishness (high temperature). It can also loosen stubborn mucus (phlegm) and provide relief from chesty coughs. 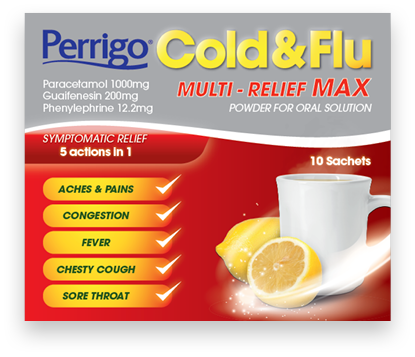 Perrigo Cold & Flu Multi Relief Max Powder for Oral Solution Paracetamol 1000 mg, Guaifenesin 200 mg, Phenylephrine 12.2 mg. For the relief of symptoms of colds, flu, sinusitis and chesty coughs. Do not take with any other paracetamol-containing products or with other cold, flu or decongestant products. Always read the leaflet. This medicine is used for the short-term relief of the symptoms of colds and ­flu, including aches and pains, headache, sore throat, nasal congestion, chills, feverishness (high temperature) and provides relief from chesty coughs. 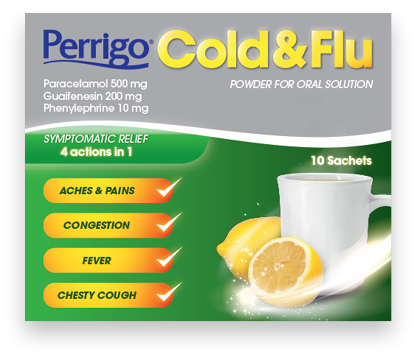 Perrigo Cold & Flu Powder for Oral Solution Paracetamol 500 mg, Guaifenesin 200 mg, Phenylephrine 10 mg. For the short-term relief of symptoms of colds, flu and chesty coughs. Do not take with any other paracetamol-containing products or with other flu, cold or decongestant products. Always read the leaflet.